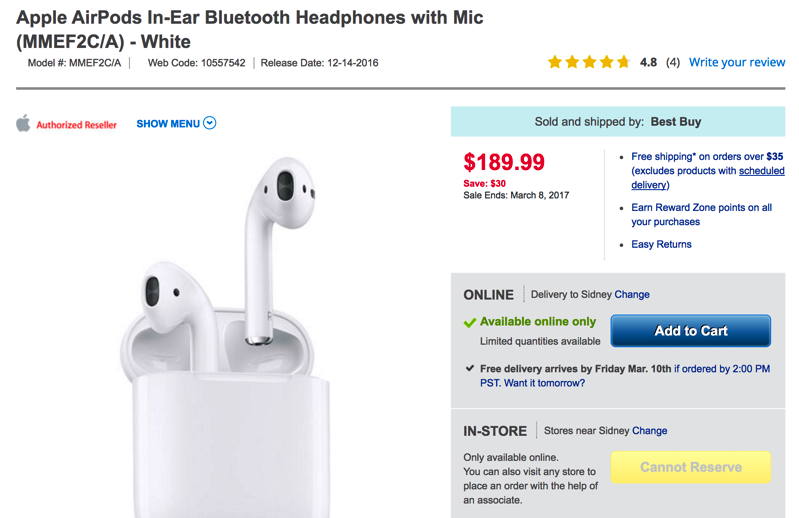 Apple’s AirPods are on sale at Best Buy right now, a one-day sale offering $30 off the wireless headphones, taking them down to $189.99, which is about 14% off. This is the first time we’ve seen AirPods go on sale from an Apple reseller. Stock is showing available online, as this sale is not available in stores. According to tracker iStockNow, only three Apple Stores in Canada have AirPods in stock right now (2x Montreal; 1x Toronto). Another way to get AirPods on sale is from The Source at 20% off, if you’re a GoodLife Fitness member, for example. This sale from Best Buy makes it easy though if you don’t want to jump through the hoops. AirPods finally launched in late December in Canada, following a postponed rollout, priced at $219.99 CAD. If you’ve been waiting to get some AirPods, this is your chance to nab them on sale. Let us know if you’re going to jump on this. Click here to read our AirPods review. Update 2 1:56PM PST: Looks like Best Buy has taken the AirPods listing page down. Doesn’t look like AirPods were supposed to be part of the sale.